The SAW and TAZ adventure is one that goes a decade deep. For this famously gruesome horror film, Jim Evans/TAZ brought the iconic, devilishly cruel clown puppet to life in his chilling poster interpretation for the film’s initial release back in 2004. From that day onward, this familiar, rather terrifying image of the SAW clown became enmeshed in pop culture – emblazoned across t-shirts, hoodies, tanks, and, of course, posters. 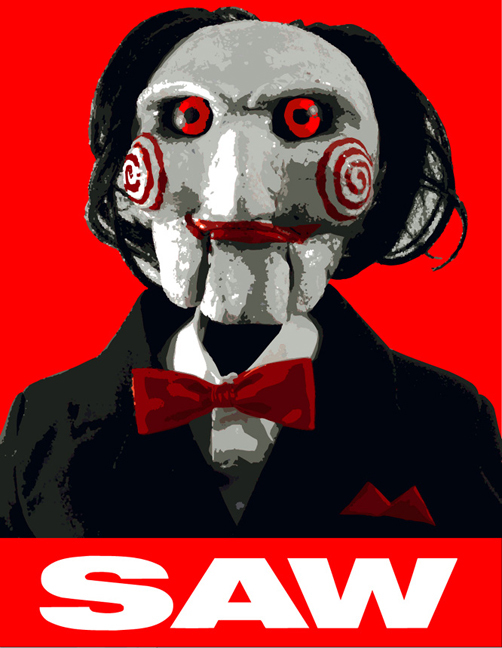 Working with Lionsgate Films’ marketing chief Tim Palen, that Evans describes as “an amazingly creative guy who comes up with ideas that make work fun,” Evans/TAZ is responsible for designing a series of 200 limited edition collectible posters for SAW and SAW II. Silkscreened by Rolo Castillo, this particular creative venture, beginning in 2004, actually brought together the original TAZ team. 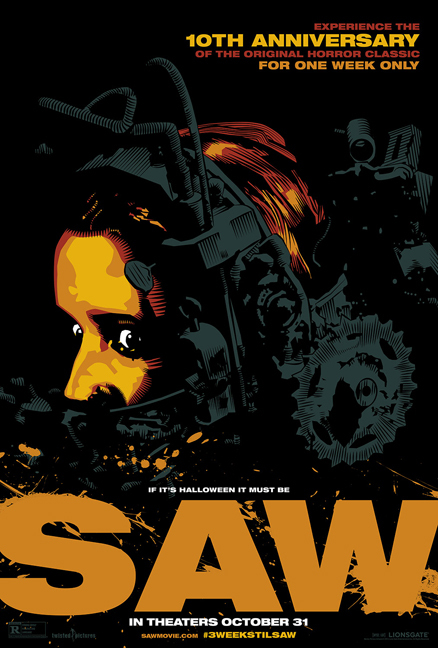 Implementing Palen’s concept of designing a special limited edition collection of silkscreen prints using iconic imagery from SAW and SAW II, and dispersing the prints to filmmakers, distributors, et al, these original signed posters have become rare and cherished bits of design and film ephemera. 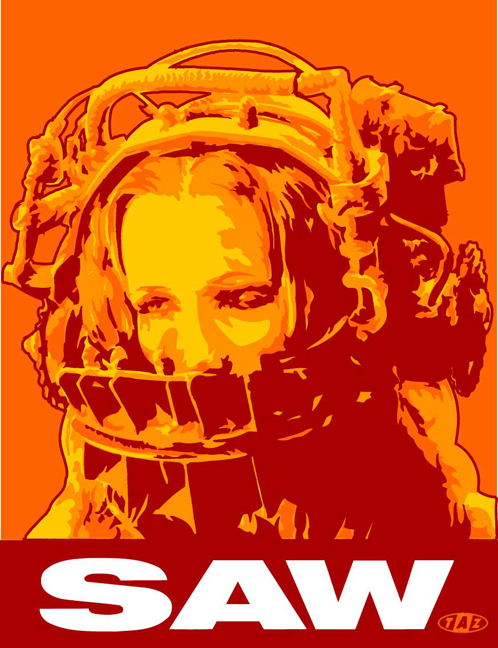 Though Evans’s digital design company Division 13 worked on the marketing for many of the SAW films, including websites, ads, and viral marketing, he did not produce any artwork for SAW III and SAW IV. He did, however, create a couple images for SAW V, which ran as limited edition giclee prints rather than silkscreens. 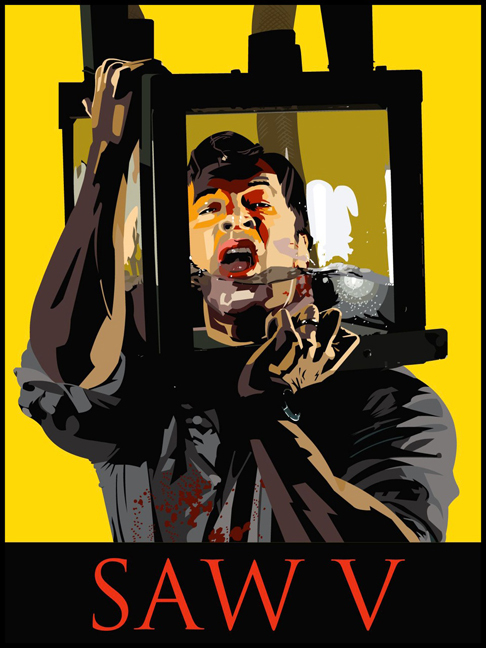 The SAW series isn’t over yet – more gore’s to come in 2015, in the way of the “SAW VIII.” More gore and, perhaps, more fantastic, unforgettable TAZ designs along with it. Jim Evans, founder of the T.A.Z. 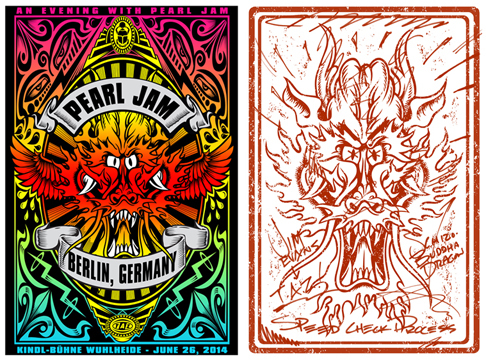 collaboration, which created hundreds of rock gig posters, record sleeves, and rock ephemera, has been working on new posters including his recent double sided Limited Edition signed and numbered T.A.Z. 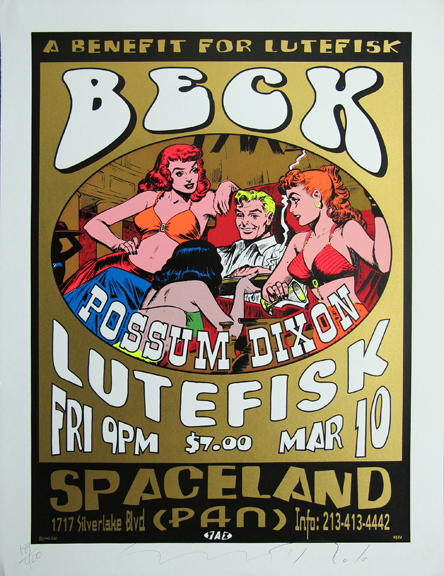 Pearl Jam poster. 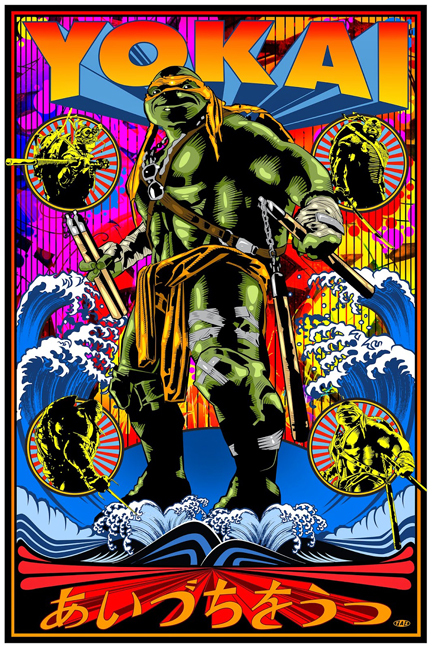 The Teenage Mutant Ninja Turtles have always been a cool comic myth, and represent the kind of characters that an artist loves to have a chance at interpreting. When Paramount called and told me about their idea for the Legend of the Yokai, I got pretty excited. They wanted a number of different artists to visualize one of the more nobel aspects of the Turtles. I choose brotherhood, and took the opportunity to pay homage to my favorite pop poster artist Tadanori Yokoo with a wild psychedelic design. T.A.Z. 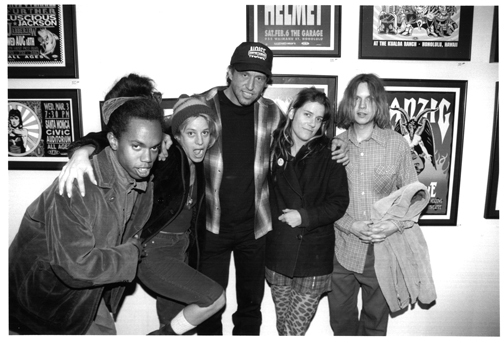 has worked with many great artist including Beck and L7. Continue to follow this blog for updates on TAZ. 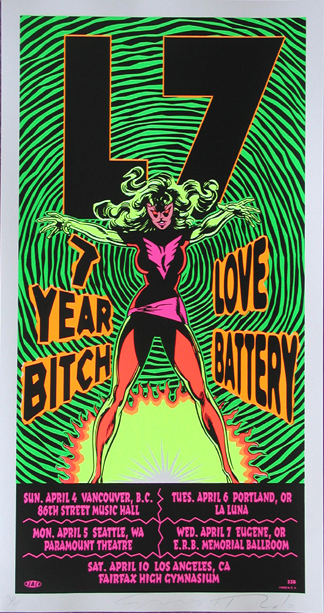 Limited Runs, the premier destination for discovering and buying the best in original vintage posters, print art and fine art photography, continues to add new items to the site every day and each week we feature some of our latest additions of original vintage film, advertising and rock posters, art prints and photography.